World class fishing is the name of the game in Cabo San Lucas. And when it comes to finding the perfect fishing charter, the RumRunnin is right at the top of that list! 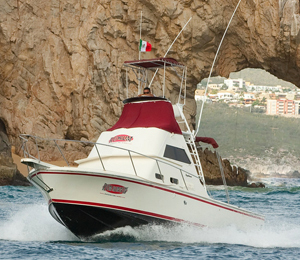 The RumRunnin is the ideal boat for an excellent and successful Cabo fishing excursion. This boat is a 32-foot Crystalliner that comes complete with fighting chair, on-board bathroom, single-engine inboard Cummins, and all the upscale fishing gear, reel and rod necessary for the best fishing trip possible. The RumRunnin is part of our team of top of the line fishing vessels that operate successful fishing trips daily from the Cabo San Lucas Marina. When choosing a Cabo fishing charter, you have a lot of options, and a lot of those options are not the scale or level of what we provide here with our fleet. Not only is the RumRunnin itself an ideal vessel for fishing, we work only with the most professional and experienced team of Cabo fishing captains. We do not cut corners when it comes to providing you with the type of fishing trip you expect and dream of. What is more is that we also provide a full lunch and snacks for you to keep you happy throughout the trip. Of course you are more than welcome to bring extra snacks and drinks. We provide bottled waters and an ice cooler. We pride ourselves in offering a first class trip to all of our guests. This is why many of our charters do book up well in advance, so we also highly encourage people who are interested in fishing in Cabo to book early! I have been to the Bahamas many times, but RumRunnin' - 32' Crystaliner is one of my favorite trips! It includes everything that everyone should do here. As a Bahamas veteran, I can say only the best about this experience!